This is such a bad outside shot, sorry! Look at this finish and color! Yum Yum. I used 3 coats, the formula was a tad runny it hit my cuticles a few times. Nothing really bad tho! 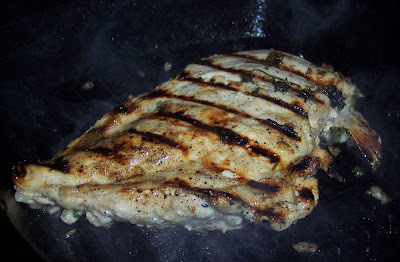 Speaking of yum yum, we had marinated grilled chicken the other night. 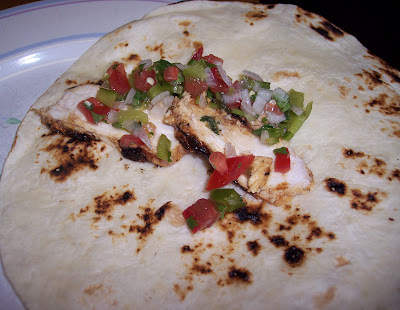 I like to burn my tortilla just a little, then a couple of pieces of grilled chicken with homemade salsa on top. I scarfed these like no other lol. I love the shade and finish of that polish! Your chicken looks so good and the homemade salsa looks like it would taste divine. Yummy! Love the nails and the shade (as always) but man that dinner looks delicious! I would scoff these too! Yum Yum! Kae! I just did a post on a similar color...you always do it so perfectly! :) and the chicken torilla looks delish! Me too, it was a shocker! It was quite delicious in my belly! Thank you, dinner was a hit that night! Hi! Thanks, I liked your color too. I was so full after eating like 3 of those aaaaah. Very pretty shade on you. Really does look like too much cream in the coffee. Dinner looks good too! I wouldn't say no for that chicken! That OPI is beeeeyoooutiful. I need it! Ha! I love tortillas - have you tried making a tortilla sandwich with melted cheese, chorizo and sour cream? Just put one in the frying pan, chuck the filling on top, squish another one on top and flip! I'm drinking a coffee with tons of milk in it right now ha. Thanks! You guys must have really delicious sweets there, aaaaaaah! Thanks! Ah let me grab a paper for you! I'm making a cilantro chicken tonight :D want some?! Oh that looks delicious... both the polish and the chicken look good enough to eat. The pearly finish on the OPI is really pretty!